Were you born between 1955 – 1990? Would you like to read the Sydney Morning Herald edition of the day of your birth? We have recently purchased a subscription to the Sydney Morning Herald Archives online. The archive currently covers the period from 1955-1990. This database is available to search, free, within any of the Sutherland Shire libraries. So next time you are visiting us ask a librarian to show you how. Maybe you need to check out a newspaper story that happened recently. Well you can do this from home! We have 2 products that provide full-text newspaper articles to library members online. All you need to do is type in your membership number (from the barcode on your library card) and away you go. To access the newspapers online go to our JournalSearch site and look up Newspaper Articles in the subject search. The two choices for remote use (outside the library) are Australian & New Zealand Resource Centre (ANZRC) and Proquest Australia & New Zealand Newstand. A search for equine flu in ANZRC today shows 177 articles, 164 of which were written since August 20 2007! All the major Sydney newspapers are represented, along with the majors from around Australia and the AAP Newswire Service. Do you like to keep up with the major news in all the Sydney papers but can’t justify the waste of trees? Missed a day and want to catch up? These databases could be your solution. You can look up the newspaper or magazine you want to read and and get a list of all the articles that were included from a particular issue. The Australian from August 27 2007 has 218 entries - all the news without the ads! Horse & Rider for August 2007 has 32 entries, you could save on that expensive subscription and the articles are in PDF so you don’t miss those beautiful horse pictures. We have plenty of other database options that allow you to view newspapers, magazines, academic journals, reference books and more online and many are available to library members wherever they are. Check out our Journalsearch site and get exploring - Have fun! Not a member? Don't miss out, just pop into any branch library and join up (bring your driver’s license or a household bill as proof of your name and address). The long wait is finally over – the winners of the Children's Book of the Year Awards for 2007 have been announced! Read on for the winners and how you can get involved at your local library during Book Week. The theme for 2007 is READiscover and at Menai Library we decided it was a great time to do some space exploration, so why not drop in and check out our displays or come to one of our special storytimes at 10.30am on Wednesday or Friday morning? And don’t forget to pick up a copy of the Book Week edition of our children’s magazine ‘The What’. READiscover Cronulla's kids section as a newly transformed jungle - a book week jungle. 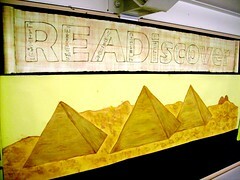 That's right its book week again & this years theme is READiscover. Cronulla is putting out the challenge out to its borrowers to discover the hidden book week characters hiding in our jungle poster, can you find all ten? Additionally, Cronulla will hold numerous school visits, celebrating the high quality of children's books produced every year here in Australia, including role plays games and waddling like a penguin. Don't let the schools have all the fun! Go on safari and READiscover all the wild and wonderful creatures that can be found at Cronulla Library - but watch out for those tigers! Well, it's been a long time between drinks, but we have finally got around to putting together another Caringbah Happenings report. Before I get around to talking about Book Week, what about last weekend's weather? Unfortunately, I wasn't able to make the most of it as I was busy finishing off Harry Potter and the Deathly Hallows. At over 600 pages, this is one book that you won't be able to read in a day (well not if you want to enjoy it anyway!). On to Book Week. 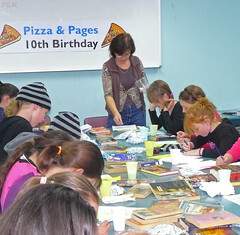 The announcement of the winners for the 2007 Children's Book of the Year Awards is being made today. The standard of the books in the running for the 2007 Picture Book of the Year is very high, however, I will go out on a limb and tip The Arrival as my favourite for winning the prize this year. The Arrival is a beautiful book (colour is used to great effect) that tells its story without the aid of any words at all. During book week here at Caringbah we will have plenty of school visits. For each class that comes in we will explain a bit about Book Week and the books that were nominated in each category (Categories include, Book of the year for Younger Readers, Book of the Year for Older Readers, Best information Book and Best picture book) as well as a few fun activities for them to do. The Children's Book Council has more information about Book Week. Don't worry, our regular storytime & rhymetime sessions will continue during Book Week. And, when you come into the library during book week check out the Ancient Egypt display put up by the Caringbah staff to coincide with the theme this year which is READiscover. 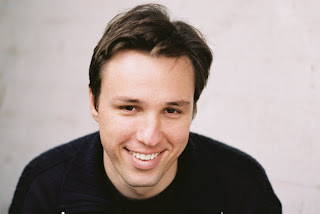 Keep the evening of Tuesday 4th September free for what should be a very interesting talk by local author Markus Zusak, as he discusses his multiple award winning novels The Messenger and The Book Thief. Markus grew up in the Sutherland Shire. He occasionally works as a high school English Teacher, and plays in a football team that never wins. His work is widely acclaimed and is published in the USA , UK and throughout Europe. His children's books include the award-winning trilogy The Underdog, Fighting Ruben Wolfe and When Dogs Cry. The Messenger, published in 2002, is the story of the hapless Ed Kennedy, a man who is chosen to care. He makes his way through town helping and hurting (when necessary), until only one question remains: Who’s behind Ed’s mission? His latest book, The Book Thief, is set in Nazi Germany during World War II. On the surface it is the story of Liesel Meminger, a foster girl living outside of Munich, but teh message is about the ability of books to feed the soul. Ultimately, Markus' writing explores the humanity, which should make for an interesting evening. The talk will be held at Sutherland Library and starts at 7pm. There is no charge and bookings are not required - just show up! Take a look at our Events Calendar for all the details. We have just updated the template for our blog with a new look and feel. All the old content is still there we have just changed the layout and colours slightly. We have also added a few new features. You can now search the library catalogue directly from the blog, subscribe to recent comments via RSS and see a list of websites added recently to Sutherland Shire Libraries del.icio.us bookmarks. Have a look around and leave a comment to let us know what you think of the changes. Freelance police investigator Aristide Ravel comes to the aid of Jeannette Moineau, an illiterate servant girl accused of poisoning the master of the house where she works, but his case is complicated by a household brimming with suspects and motives and by the deaths of additional family members, in a mystery set against the backdrop of revolutionary Paris. When a man wrongfully arrested for murder hangs himself, forensic psychologist Jill Kennedy, who helped put him away, moves to a sleepy village. But when the vicar’s wife is murdered, Jill discovers that village life isn’t the retreat she’d hoped for. A dangerous new drug has emerged into the nightclubs around Newbury. Entrium Trilenium, otherwise known as Entry, is easy to manufacture, looks deceptively like ecstasy, but is incredibly lethal. After the deaths of two young girls at a local nightclub, Superintendent Gregory Summers and his team believe that they’re after a small time drug dealer on a probable manslaughter charge. However, their investigations take a devastating turn when tragedy strikes close to home. A haunting, evocative portrait of three generations of a family by an exciting and inspired new voice in fiction. Salt is a family saga that explores the relationship between people and the landscape in which they live. Atmospheric and lyrical, Jeremy Page's debut novel is revelatory in its use of language. For fans of John Banville and Marilynne Robinson, Salt signals the introduction of a significant writer. The women of Mariquita – made widows when their men are swept away by the army or rebel forces – learn hard lessons about love and survival. Forced to grow in extraordinary ways, they challenge the tenets of male–dominated society, discover power with all its pitfalls and strive to create an entirely new social order, an all–female utopia. Janet grew up with her father; her mother, she was always told, died when she was three. But now she discovers she has inherited a house from her mother—who, she learns, died only recently. In a state of shock she travels north with the key: and finds an old stone cottage at the sea’s edge. Set in the suburbs of simmering Los Angeles, NEVER FEAR is a fast-paced thriller featuring Alex Delillo, detective and single mother. Seventeen years ago, three young women were murdered; their bodies dumped in the wasteland of the Los Angeles River. The serial killer was never found. Now, Lieutenant Alex Delillo, is forced to re-open the case after the brother she never knew existed, a private investigator, is found murdered. As Alex gets closer to the truth behind her brother's murder, alarming flashbacks from her childhood start to plague her and she realises that the truth may lie closer to her life than she could have ever imagined. Breeze Copens is a forensic psychologist with paranormal abilities. When she must recommend that Daryl Collins be released from prison because on paper he is not a threat, she knows it’s a dangerous mistake. The Flanagans, Tanners and Lovells all live on the top floor of a crumbling Victorian tenement in the heart of London's East End. It's 1936 and Britain is in the grip of the Depression. Nell Flanagan is a decent, hardworking woman, married to Stephen, a tough, heavy-drinking brute of a man, who works as a casual in the docks — when there's work available. Nell has hidden the abuse she has suffered at his hands from her young children, although most of the neighbours realise what's going on. A powerful family drama set in India and Scotland, from 1915 to the 1960s. It's 1915 when young Bess Ravenhart, recently widowed, leaves her baby son Frazer with her mother-in-law, Cora, while she sails from India to Britain to set up a home. But Cora has no intention of returning Frazer to his mother's care. In the bestselling tradition of The Devil Wears Prada, Karen Yampolsky's hilarious and disarmingly candid debut goes deep inside the glossy, glamorous, and completely ruthless world of magazine publishing, where bitchiness and betrayal are always in vogue, and this month's hotshots are just one dud issue away from a pink slip and a one-line career obit on Page Six. Anna lives with Oliver Robinson and their 3-year-old son Charlie. They met when she worked as a waitress at his restaurant; he had recently separated and she was a shoulder to cry on. But friendship turned to love. Now she juggles motherhood with part-time work and she couldn't be happier. Or perhaps she could? Oliver has never divorced his first wife Eve who is everything Anna is not.